Although many of these dogs look slightly different, there are some qualities that are generally the same. They are medium in size, usually have a more rough textured fur, and have short coats that can be a variety of colors. Most of the time, these dogs are either brown, white, black, have spots of any color, or have a brindle coat. Their ears can be either pointed or floppy, their snout is usually medium to long, and they are known to hold their head up high. Aspins are known to be extremely kind and lovable to all people. They are native dogs to the Philippines and are often seen roaming the streets although now they are becoming more of a house dog. They are calm, happy, and get along nicely with children. Overall, there is nothing negative about this breed because they are very low maintenance and fun to have around. Aspins do not have any major health problems to watch out for. Like any other pet, bring them to the vet for regular check ups. Aspins are a medium sized dog that would do well in an apartment or a house as long as they get daily exercise. They require little maintenance and are more independent since they grew up on the streets. If you have a yard make sure it’s fenced in otherwise they are known to walk away to roam around the area. These dogs do not require a high level of exercise. As long as they get walked daily or are aloud to go outside and explore, they are happy and content. In the Philippines, these dogs are often known to roam the neighborhood and streets on their own and are able to find their way back home around sunset. They are very street smart and don’t require a lot of attention. These dogs have short coats and do not need to be groomed regularly. Give them a bath when necessary. 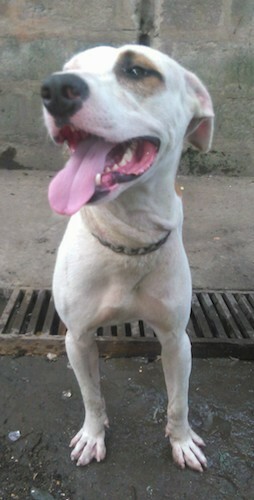 The name Aspin is a shortened version of “asong Pinoy” which can be translated to native dog. These dogs do not have specific ancestors that contributed to what they look like today. In fact, even today, there is no specific look for the Aspin breed. This is because they are bred from a variety of mutts and mixed breeds that are roaming the Philippine islands. This breeding style makes the Aspin dog healthier than most other breeds because they are naturally bred rather than humans putting together certain dogs until they mate. This process makes it so there is less inbreeding which leads to less health issues and a more balanced breed because it shares so many different traits. Naturally, Aspins are all around the same height, have short coats, and similar features. Because these dogs are not bred for their specific characteristics, they can share many different traits from one dog to the next. Generally, most of them are relaxed, intelligent, independent, playful, and friendly. Some say that in the past, many Aspins were used as guard dogs which makes some of these dogs more prone to be wary of strangers. Today, Aspins are becoming more popular within the Philippines in both peoples homes and the workforce. The Philippine Army currently uses over 40 Aspin dogs to help them with various tasks. In 2016 an Aspin named Roy was awarded a certificate for helping with the search and retrieval team after a landslide rescue mission. In another case, an Aspin dog breed jumped in front of two young citizens in order to save them from being hit by a motorcycle. When people around the world heard that the dog badly injured it’s face, donations from over 45 countries were collected for the dogs recovery funds. Today, the Aspin continues to rise as a popular dog in the Philippines but they are rarely seen in other countries.